Address: Avenida Del Jablillo s/n, Costa Teguise (Lanzarote), Islas Canarias. 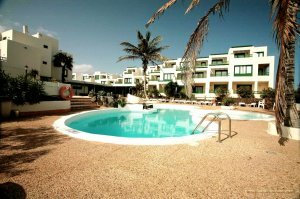 The oceanfront Neptuno Suites, in Lanzarote’s Costa Teguise, offer direct access to Jablillo Beach. Set around outdoor pools, each apartment has a safe and a private terrace, many with sea views. The bright, functional apartments have a small kitchen area with a fridge and kettle. The spacious living room includes a TV and sofa. Neptuno Suites offers a range of services, including bicycle rental. The complex also has a hair salon and a gift shop. Free WiFi access is provided. The Neptuno restaurant, set in the same building, is one of the most popular on the island. There are also various supermarkets and bars within a short walk. Please inform Neptuno Suites - Adults Only in advance of your expected arrival time. You can use the Special Requests box when booking, or contact the property directly with the contact details provided in your confirmation. Reception is open from Monday to Friday from 09:00 to 20:00 and on weekends from 09:00 to 18:00. Please contact the property in advance to confirm your flight arrival time. Please note that only dogs up to 5 kg. are allowed in the property.